It isn't easy to set up a production learning space on campus for the online learner. Even harder is setting up a classroom that can accommodate the remote learner while also handling presentations for face-to-face students. That was the challenge handed over to Phil Conrad, director of technical operations for the Engineering Professional Education program at Purdue University. The program delivers courses online and in person to working professionals who are pursuing a graduate degree in engineering via distance learning. In Spring 2015 it encompassed nearly three dozen classes and 10 different departments catering to about 610 students. Job one for Conrad and his team would be the installation of a new audiovisual system, which was being tackled in two phases, each with its own vendor. The first phase was system design; phase two would cover procurement, installation and commissioning. Although phase one went without a hitch, phase two — where the new gear all got plugged in — didn't go quite as planned. The engineering program's old classrooms looked like they were "designed to record the lecture, not to interact with the students," according to Conrad. Monitors outfitted with microphones populated the desks. Tables and chairs were bolted to the floor. Moving anything around was near impossible. When anybody in that room spoke, the sound quality was iffy for the person trying to listen in online. Determined to provide a better experience for everybody, the university laid out specific requirements for the new physical space: soundproofing, acoustic panels and ceiling mics (which would be out of the way and less intimidating for students physically present). To be able to turn lectures around quickly for online use, Conrad's team chose Telestream appliances to do the encoding, which would allow the school to provide recordings within 20 minutes from the time the lecture was completed. The encoding process would capture the lecture, creating a massive file, then compress that down into an MPEG-4 file and push it onto a Web server. To make sure lectures weren't lost due to technical difficulty, the division used two layers of backup. And for real-time lecture streaming, the staff implemented a Wowza Media Systems server too. But on top of those new features, the division sought ways to create a more engaging environment for students attending class in person. That included removing monitors from desks and designing a more interactive classroom layout that incorporated mobile tables and chairs for maximum flexibility. Faculty members could wear wireless mics. While that would allow them to walk around the room more freely, it also would make tracking them with a video camera trickier. 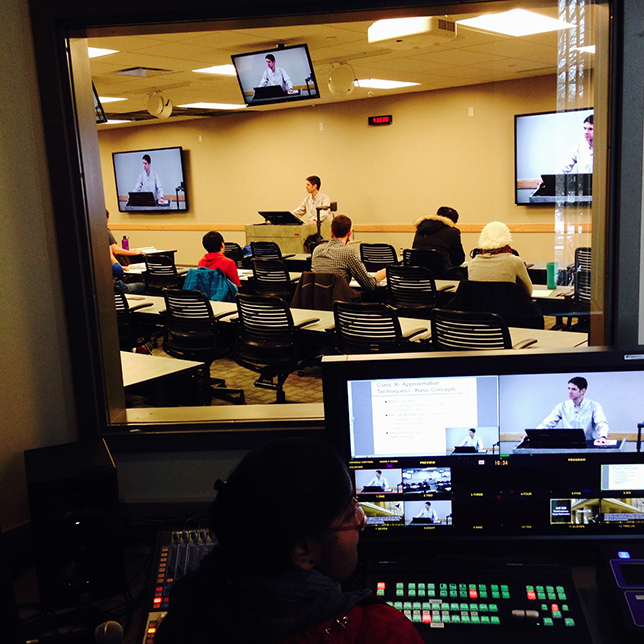 To make the recording process as simple as possible for the instructor, a student worker would sit in a small control room to handle the production using an audio mixer, camera controls and video switcher. The operator was positioned behind a window, visible to faculty members visibility so they could signal when help was needed. In the largest of the multifunction classrooms, accommodating up to 75 students, 90-inch screens on the wall would provide clear views of anything being displayed or demonstrated by the instructor. The rooms were designed to operate in two distinct modes. "Presentation mode" meant the equipment in the room wasn't being used for recording lectures; it was simply the space where the class met. The operation of capturing a class was referred to as "production mode." The two modes could be switched with a single button. Initial testing of the new space "identified a few little bugs" to work out, said Conrad, but overall the testing went well — and the room officially opened for business in January 2015. "It was an exciting moment," recalled Conrad. That is, until things started falling apart. The seeds for the first challenge were actually planted months earlier when the lead architect handling phase one, the design of the system, left the firm. That departure generated communication issues in phase two, and the vendor struggled to make sure it understood all of the requirements of the project. Another challenge surfaced with the automated scheduling function, which kicks off certain tasks when a class begins, including the start of backup systems. Accommodating both presentation and production modes required custom programming that was made even trickier because courses on Monday, Wednesday and Friday last for 50 minutes, while those taking place on Tuesday and Thursday run for 75 minutes. "We're still at the tail-end of getting the final bugs worked out," noted Conrad. Also, the Telestream setup didn't go as smoothly as the school hoped for. The vendor handling the implementation was onsite for a few days, and when they left, Conrad said, "things weren't completely set up." An intermittent bug cropped up through the smart podiums, causing a momentary flicker during some of the presentations. That wouldn't have been so bad except that the flicker would create an annoying beep in the recorded lectures. Conrad's team ended up re-recording one lecture "because the beeping was so bad," he recalled. The problem turned out to be a conflict with the PCs connected to the video switcher. Installing scalers helped resolve the issue. Audio in the room posed another problem. In spite of the upgrade in mics and their careful placement around the ceiling, some of the students in the class still couldn't be heard when they spoke. Turning up the audio on the ceiling mics generated feedback. Working with the vendor, the crew made additional adjustments to the audio system, including turning on an echo cancellation feature. 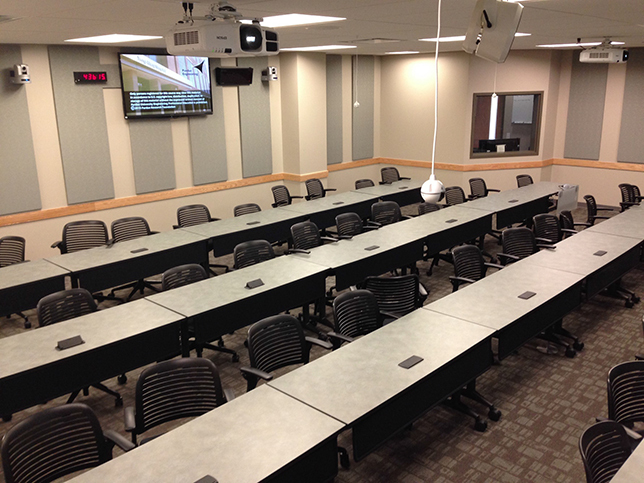 Now one multifunction room accommodates 75 students in person, and others hold 45 and 49. An overflow room can seat 24 people. Should an instructor want to add additional students beyond the limit of a room, the division has that capability. Conrad's team simply patches the lecture into the overflow room, and those in the overflow space become on-campus versions of remote students. In spite of the hiccups that surfaced in the new spaces, Conrad said completion of this "major project" warranted a major celebration too. The entire division was brought together for a catered lunch "and just to enjoy the success," he said. His crew is mapping out future upgrades, such as replacement podiums, 90-inch displays for the two smaller multifunction rooms and introduction of additional cameras to provide more flexibility in how lectures are captured on video. "When we think about the future and how they're going to be used," said Conrad, "We want to make these rooms as flexible as possible."